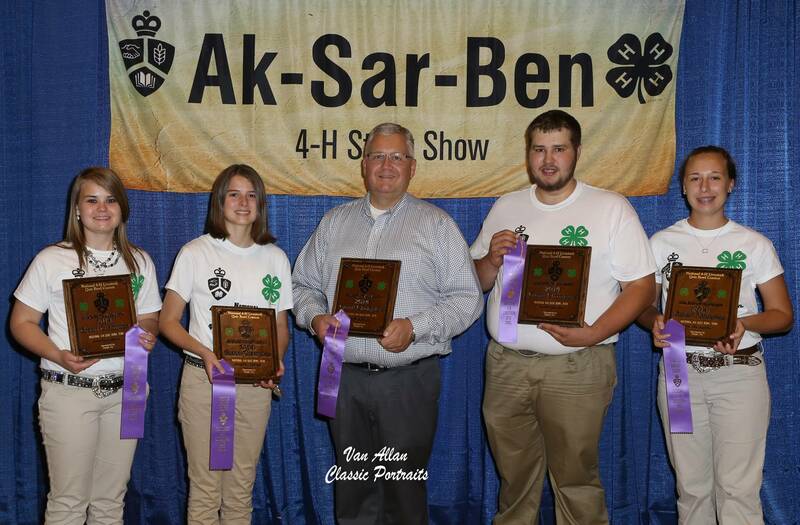 (Grand Island, NE) The 2018 AK-SAR-BEN National 4-H Quiz Bowl competition took place on Saturday, September, 29 in Grand Island Nebraska. 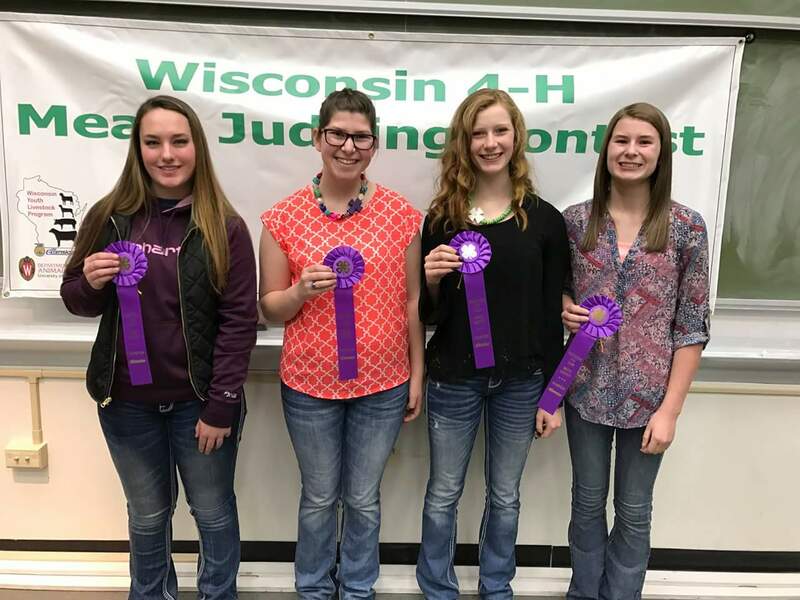 Columbia County 4-H represented Wisconsin at this year’s event and earned the right to compete by winning the Wisconsin competition back in March. 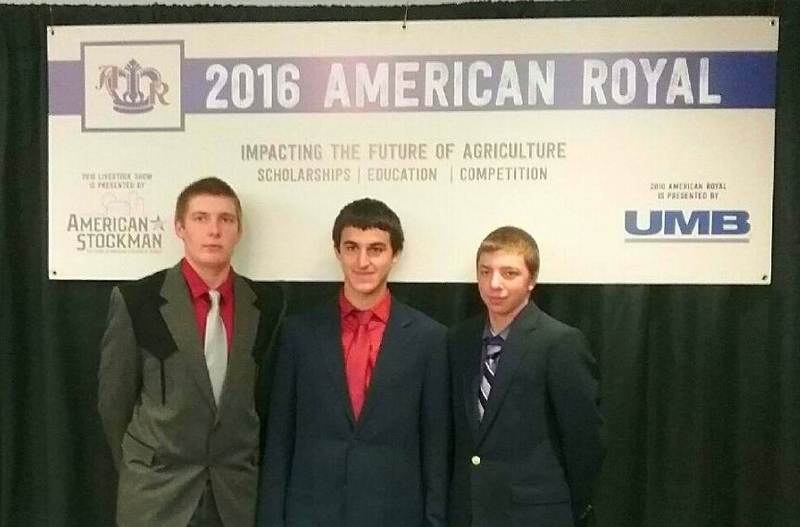 The Wisconsin team competed in three rounds before being eliminated from competition. Wisconsin Team members included: Justin Taylor, Zach Michelson, Tyler Cross and Hayden Taylor. They were coached by Todd and Lynette Taylor. For more information about the Aksarben Livestock Show and Rodeo, you can check out their page at: http://www.aksarbenstockshow.com. (Grand Island, NE) The 2018 AK-SAR-BEN National 4-H Livestock Judging competition took place on Sunday, September, 30 in Grand Island Nebraska. 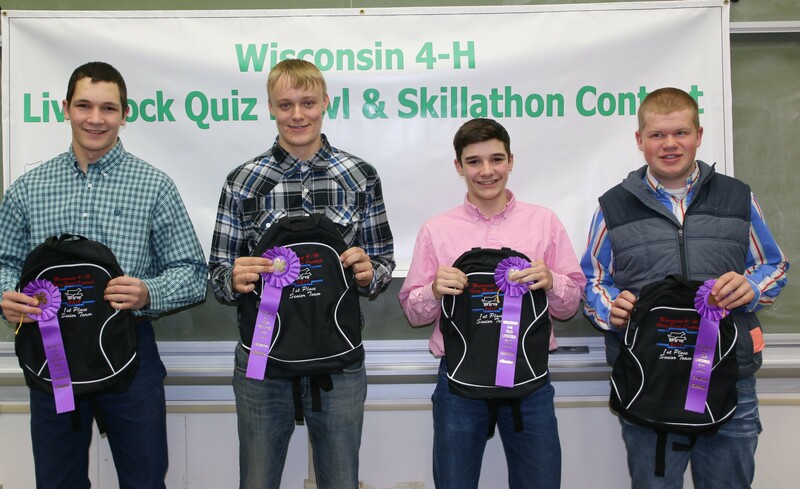 Jefferson County 4-H represented Wisconsin at this year’s event and earned the right to compete by winning 3rd place overall in the senior division the Wisconsin competition back in July. Jefferson County represented well in the contest earning 17th place out of 27 teams. Colton Klecker was 21st overall in beef. 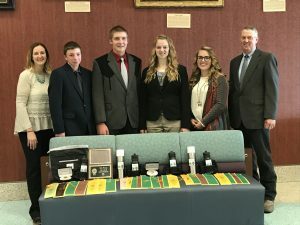 Wisconsin Team members included: Alexis Schultz, Colton Klecker, Danielle Chwala and Trevor Messmer. They were coached by Ed Bielinski. 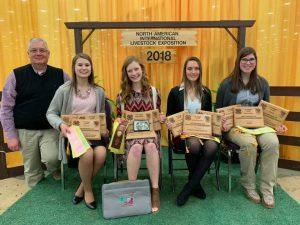 (Louisville, KY): Wisconsin 4-H was represented well at the 2018 North American International Livestock Exposition in Louisville, KY at the Livestock Skillathon Contest. A team from Marathon County participated on behalf of Wisconsin. Team members included: Kailen Smerchek, Stephanie Witberler, Emilie Pauls and Cortney Zimmerman. The team was coached by Mark Zimmerman. Congratulations to Marathon County on a 7th overall finish at the national skillathon contest in Louisville, KY at the North American International Livestock Exposition. Kailen Smerchek earned All-American status by finishing 10th overall. The team also placed 4th overall in Evaluation, 9th in ID and 5th overall in Quality Assurance. Congratulations to Kailen Smerchek for earning All-American honors for her 10th place finish overall! Team members include: L to R: Brady Palzkill, Morgan Vondra and Brandon Springer. They were coached by Mike Robinson, Lora Springer, Jeff Thomas and Matt Heins. (Denver, CO) Grant County 4-H represented Wisconsin at the 2019 National Western Round-Up Meats Contest held in Denver Colorado on Saturday, January 12th, 2019. There were 30 youth that participated from 8 states that took part in this year’s event. Team members were Blake Wegmueller, Abby Meier, Cora Kleist and Kendra Jentz. The team was coached by Dennis Patterson. Grant County earned the right to compete at the National contest by winning the senior division at the 2018 state 4-H meats judging contest. 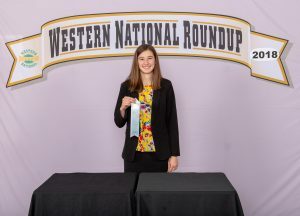 (Denver, Co:) Marathon County 4-H represented Wisconsin at the 2019 4-H Judging Contest held in Denver, Co at the Western National Roundup. Team members include: Kailen Smerchek, Stephanie Witberler, Mallory Schmoll and Hunter Falkowski. They were coached by Dan Smerchek. Marathon County finished 8th out of 27 teams. Individual highlights included with Mallory placing 10th overall. The team finished 11th in Goats, 6 in beef and and 8th in reasons. 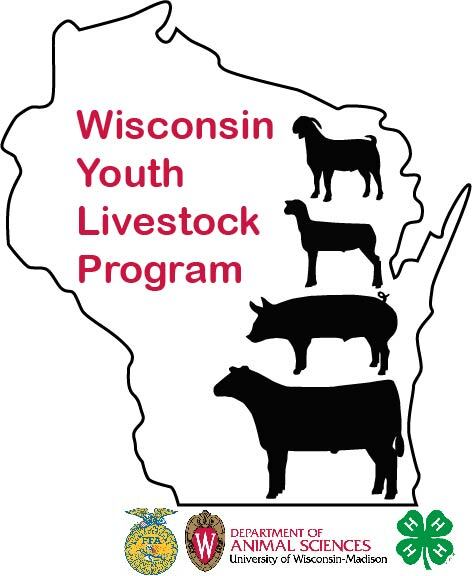 For more information about the Wisconsin Youth Livestock Program, contact Bernie O’Rourke, Extension Youth Livestock Specialist at borourke2@ansci.wisc.edu. Congratulations to Mallory Schmoll for her 10th place finish overall in Western National 4-H Livestock Judging Contest! (Grand Island, NE) The 2017 AK-SAR-BEN National 4-H Quiz Bowl competition took place on Saturday, September 30th in Grand Island, Nebraska. 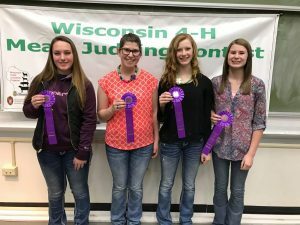 Marathon County 4-H represented Wisconsin at this year’s event and earned the right to compete by winning the Wisconsin competition back in March. 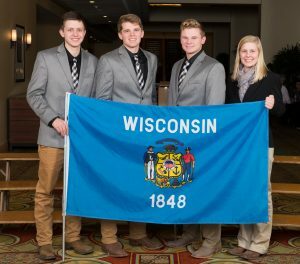 The Wisconsin team competed in three rounds before being eliminated from competition. Wisconsin Team members included: Emilie Pauls, Kailen Smerchek, Stephanie Witberler and Cortney Zimmerman. They were coached by Mark Zimmerman. 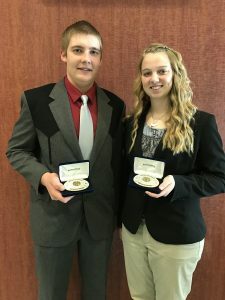 (Manhattan, KS) Marathon County 4-H represented Wisconsin at the 2017 American Royal Meats Contest held at Kansas State University in Manhattan, KS. There were 53 youth that participated from 14 states that took part in this years event. Team members were Emilie Pauls, Kailen Smercheck, Stephanie Witberler and Cortney Zimmerman. The team was coached by Mark Zimmerman. (Louisville, KY): Wisconsin 4-H was represented well at the 2017 North American International Livestock Exposition in Louisville, KY at the Livestock Skillathon Contest. A team from Iowa County participated on behalf of Wisconsin. They included: Morgan Fitzsimmons, Paige Gaffney and Nathan Daniels. The team was coached by Val Gaffney. Congratulations to Iowa County on a 10th overall finish at the national skillathon contest in Louisville, KY at the North American International Livestock Exposition. Morgan Fitzsimmons earned All-American status by finishing 18th overall. The team also placed 9th overall in Evaluation, 7th overall in Quality Assurance, with Morgan Fitzsimmons finishing 1st overall. Morgan Fitzsimmons placed 1st overall in Quality Assurance and was also named an All American for placing 18th overall individually. Team members include: L to R: Ambrose Wiering, Megan Greif, and Vanessa Roberts. They were coached by Rob Ash. (Denver, Co:) A team from Juneau County represented Wisconsin at the 2017 4-H Judging Contest held in Denver, Co at the Western National Roundup. Team members include: L to R: Bailey Miller, Clayton Walsh, Daniel Walsh and Michaela Honnold. They were coached by Lisa Walsh. Juneau County finished 21st out of 29 teams. Individual highlights included with Daniel Walsh placing 8th high individual overall for beef and was 36th high overall individual for judging and reasons. The team finished 20th in Goats, 17th in sheep, 21st in beef and 20th in swine. (Louisville, KY): Wisconsin 4-H was represented well at the 2016 North American International Livestock Exposition in Louisville, KY at the Livestock Skillathon Contest. A team from Grant County participated on behalf of Wisconsin. They included: Dillin Meier, Amber Patterson, Matt Walz, and Jessica Anderson. The team was coached by Dennis Patterson. 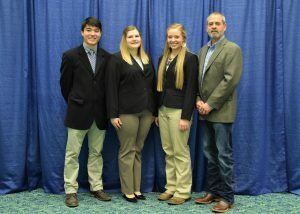 Congratulations to Grant county on a 5th overall finish at the national skillathon contest in Louisville, KY at the North American International Livestock Exposition. All Americans were: Dillin Meier, 5th place high individual and Amber Patterson, 12th place high individual. Dillin was also 9th in identification and 7th in Quality Assurance. Amber was 4th in Quality Assurance. Team ranks were: 6th in identification, 8th in evaluation and 6th in Quality Assurance! Congratulations to Dennis Patterson and team members on a great showing for Wisconsin. 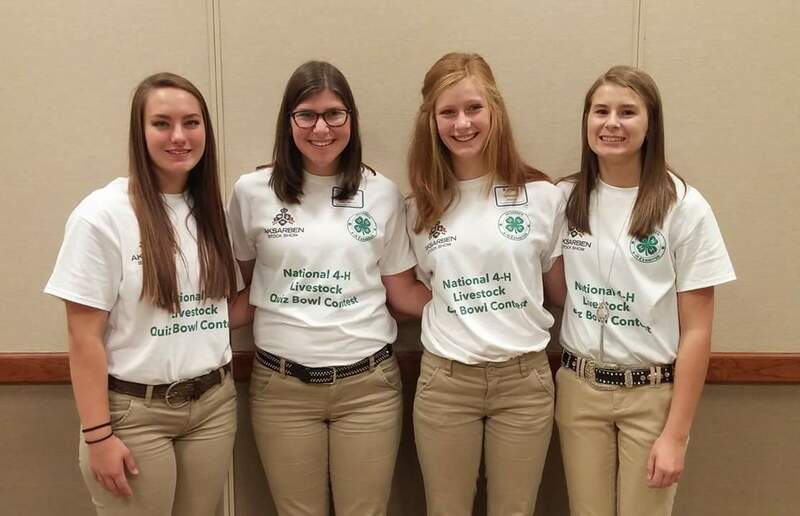 Grant County 4-H teams are no stranger to national competition. 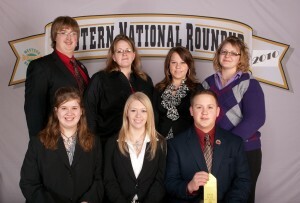 Grant County 4-H has represented Wisconsin at many national contests over the years. Grant County 4-H were the national champions in livestock skillathon in 2011, and had a team compete again in 2013. Much of their success is due to the youth’s willingness to practice and gain knowledge in these areas along with a great coach in Dennis Patterson who has encouraged youth in contests for so many years. Dillin Meier (5th overall) and Amber Patterson (12th overall) after earning their All-American belt buckles. 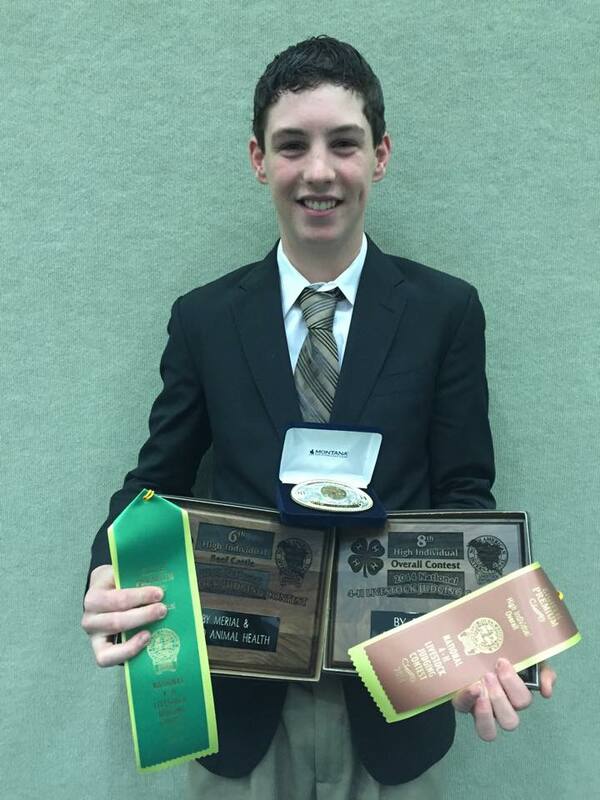 (Kansas City, MO) Grant County 4-H represented Wisconsin at the 2016 American Royal Meats Contest held in Kansas City, MO. There were 52 youth that participated from 14 states. Team members were Dillin Meier, Ben Connolly and Matt Walz. The team was coached by Dennis Patterson. Highlights included Matt Walz ranking 2nd overall in the placings division, while the team finished 10th. (Omaha, NE) The 2016 competition six rounds of competition held in the National Contest with a total of 8 teams competing. Each match included three phases with individual, team, and toss up questions. 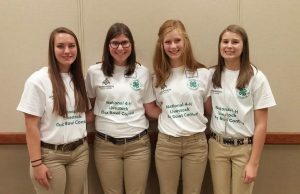 Oklahoma was crowned the National 4-H Champion Quiz Bowl Team, Kansas finished as the Reserve Champion and Nebraska placed third. 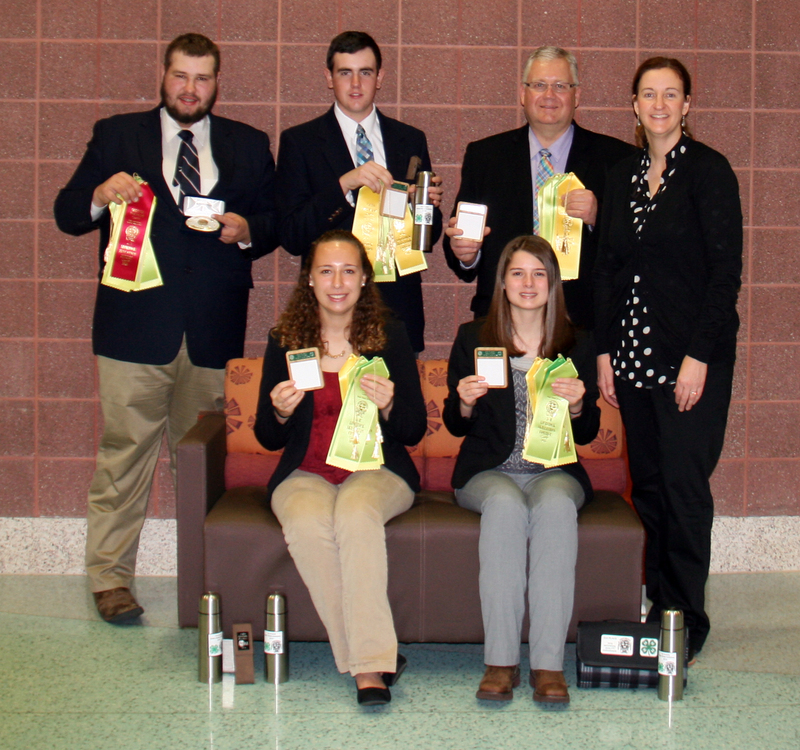 Wisconsin Team members included: Tim Rynearson, Natalie Siedschlag, Morgan Wollin and Amalia Adrian. They were coached by Christine Siedschlag. 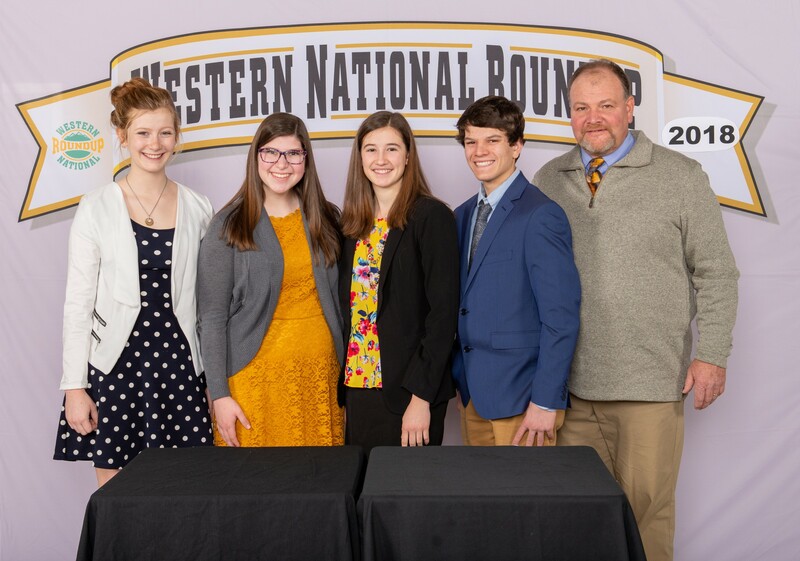 (Denver, CO): Wisconsin 4-H had three teams compete in the livestock judging, meats and quiz bowl competitions at the 2016 National Western Stock Show held in Denver Colorado this past January. 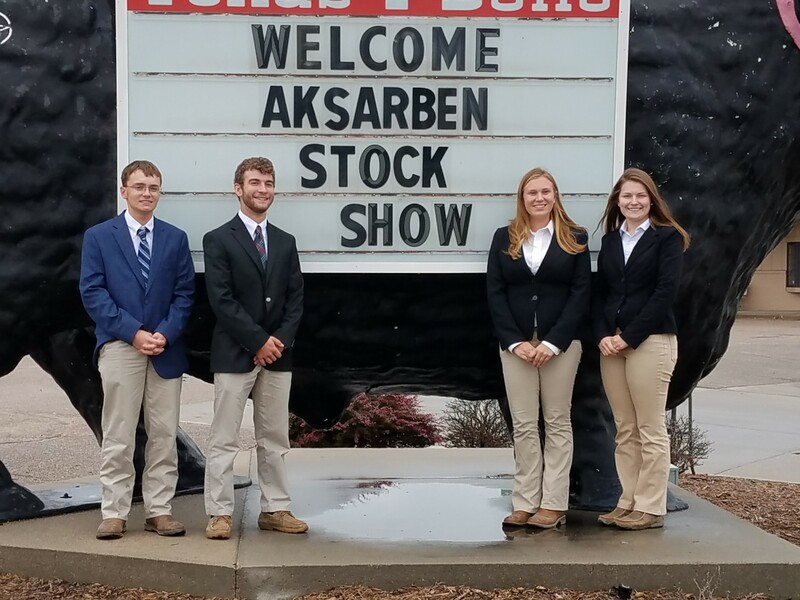 Manitowoc County had a solid day at the livestock judging competition where they ended up 12th overall. Team members included Brooke Roberts, Vanessa Roberts, Ambrose Wiering and Megan Greif. The team was coached by Barb Remiker and Rob Ash. In the Goat Division, Manitowoc placed 2nd overall team and Ambrose Wiering was 2nd high individual and Brooke Roberts was 23rd overall in goats. In Swine, Brooke Roberts was 15th individual and Ambrose Wiering was 27th overall. The Manitowoc team finished 9th in the swine division. In Beef, Vanessa Roberts was 31st in Beef, and her sister Brooke placed 45th. Team Reasons: Wisconsin placed 12th in team reasons with Brooke Roberts placing 35th, Ambrose Wiering placing 40th and Vanessa Roberts placing 44th. Individual Overall results: Brooke Roberts, 29th overall, Vanessa Roberts, 39th, Ambrose 54th and Megan Greif, 77th. Grant County also had a solid day at the meats judging competition where they ended up 9th. Team members included Ben Connolly, Dillin Meier, Mathew Walz and Cody Adams. The team was coached by Dennis Patterson. Meats placings: Ben Connolly was 11th overall, Mathew Walz placed 33rd, Dillin Meier, 39th and Cody Adams, 41st. Retail I.D. : Dillin Meier placed 22nd, with Ben Connolly, Mathew Walz and Cody Adams placing 30-32, respectively. Dodge County attended the National Western 4-H Quiz Bowl contest and placed 5th. Team members included: Natalie Siedschlag, Samual Nehls, Morgan Wollin and Tim Rynearson. 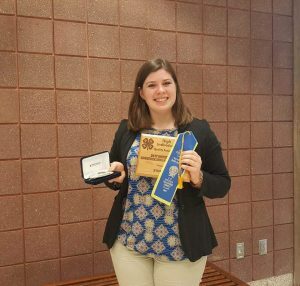 Natalie Siedschlag was recognized as the 2nd overall individual answering questions at the event. The team was coached by Christine & John Siedschlag. 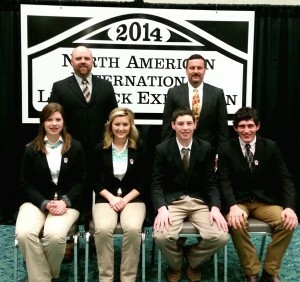 (Louisville, KY): Wisconsin 4-H was represented well at the 2015 North American International Livestock Exposition in Louisville, KY at the Livestock Skillathon Contest. A team from Marathon County participated on behalf of Wisconsin. They included: Katelyn Zimmerman, Nathan Utecht, Emma Walters and Jake Thunder. The team was coached by Mark Zimmerman. The team finished 7th overall with Nathan Utecht earning 9th place overall as an individual and receiving an All-American buckle. 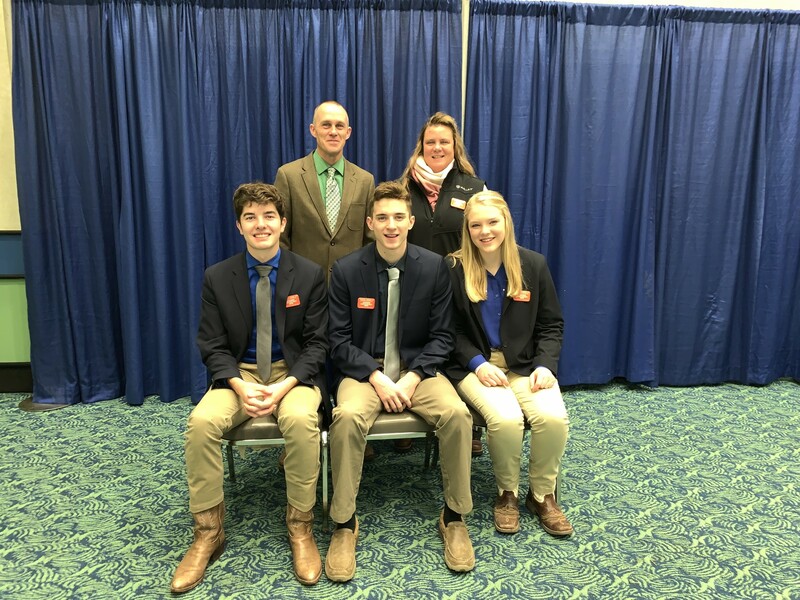 Jake Thunder placed 5th overall in individual evaluation and Nathan Utecht, Emma Walters and Katelyn Zimmerman placed 14th, 17th and 20th overall in individual identification. Nineteen teams from across the country participated, with 71 individuals. Marathon County 4-H teams are no stranger to national competition. Marathon County 4-H has represented Wisconsin at this national contest in 2010 where they were National Champions. Much of their success is due to the youth’s willingness to practice and gain knowledge in these areas along with a great coach in Mark Zimmerman who has encouraged youth in contests for so many years. 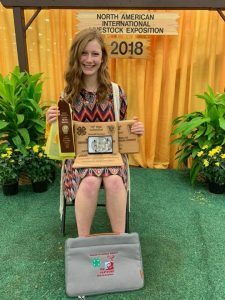 Wisconsin had been Reserve National Champion 3 times before bringing the national banner home; growing a nice tradition for the state of Wisconsin in youth livestock educational events. Nathan Utecht, Marathon County 4-H receiving his All American belt buckle for earning 9th place overall individual at the 2015 North American International Livestock Exposition. 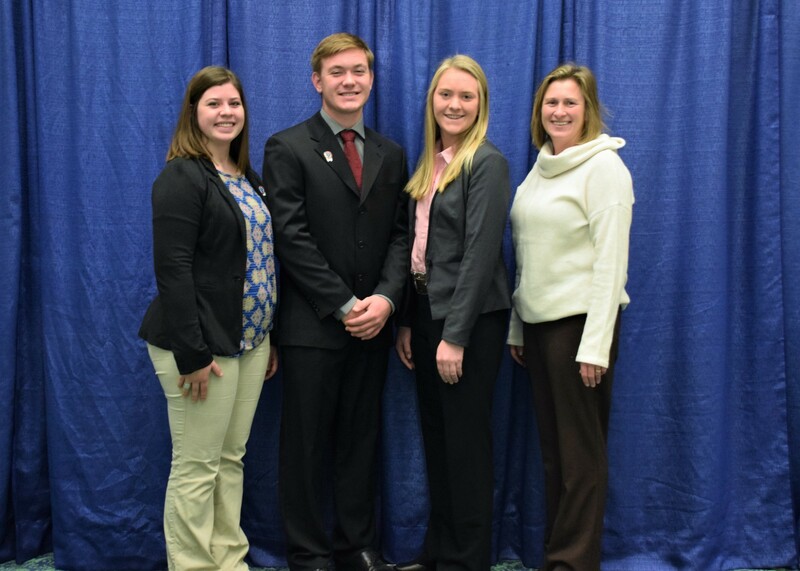 Congratulations to the Iowa County livestock judging team competing at NAILE. They placed 20th overall. Team members: Boone Schmitz, Reid Suddeth, Morgan Fitzsimmons and Erica Thomas. Coached by Matt Heins and Jeff Thomas. 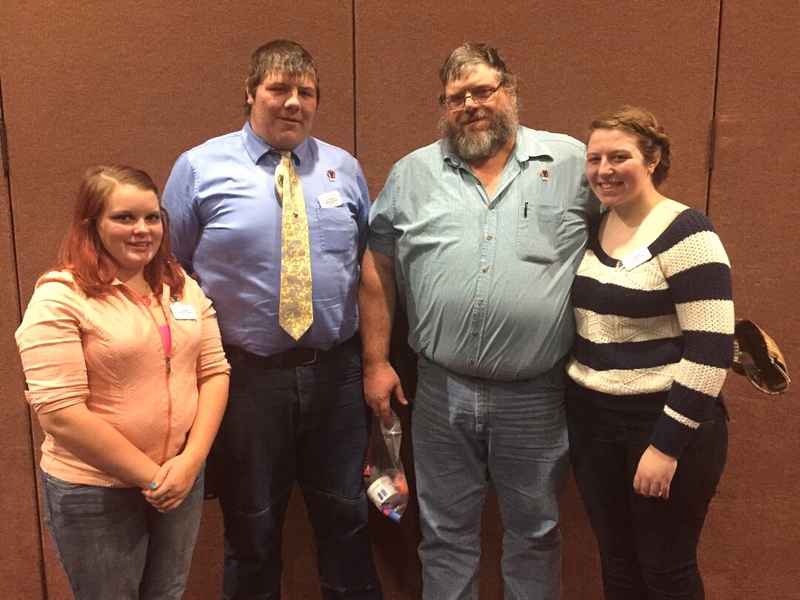 Jeff just completed his 25th year of coaching and supporting youth in livestock judging contests in Iowa county. Congrats! Congrats to Reid Suddeth on his 8th overall All-American performance at NAILE. He was also 6th in beef. Many years of practice and dedication yielded a fine judging career for Mr. Reid. Congratulations! 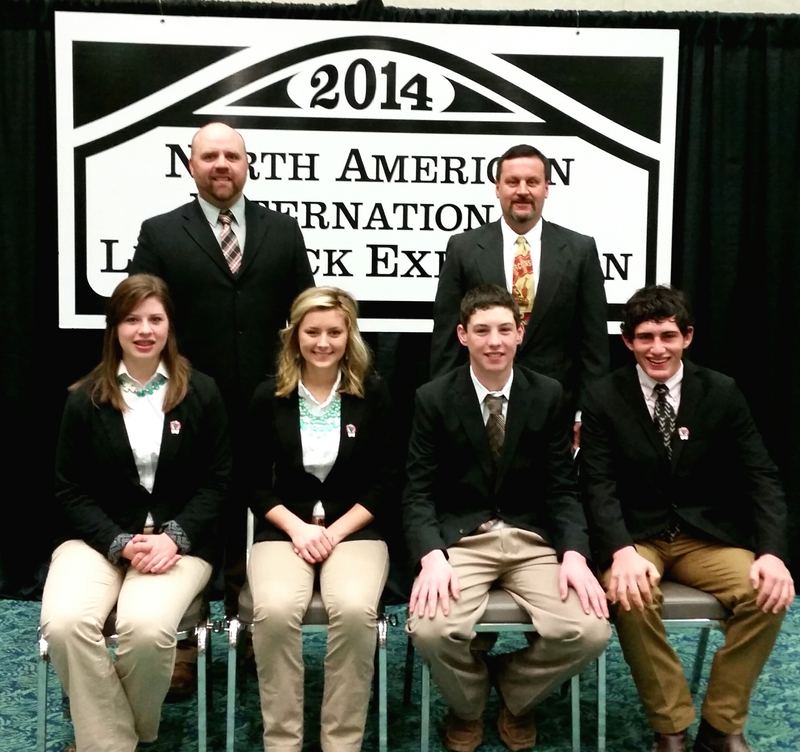 Congratulations to Polk county skillathon team competing at Naile. They were 9th in Quality Assurance and 9th in evaluation, and 13th overall. Team members: Reese Johnston, Reanna Johnston and Nicole Dittenbrenner. Coached by Brian Johnston and Tim Swenson. 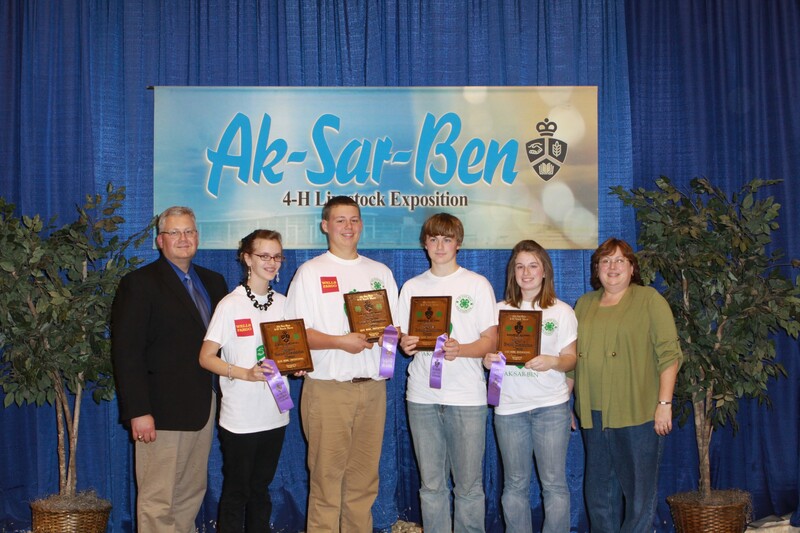 (OMAHA, NE) The 4-H Livestock Quiz Bowl team from Marathon County were crowned National Champions at the 2014 National 4-H Livestock Quiz bowl contest held the end of September at the AKSARBEN 4-H Stock Show in Omaha, NE. Team members that participated in the contest answer questions via a buzzer system format on wide array of questions that cover the beef, sheep, swine and meat goat project areas. Major topic include: genetics, breeding, reproduction, meats, nutrition and many other animal topics. Team Members were: Ashley Zimmerman, Katelyn Zimmerman, Nathan Utecht and Emma Walters. The team was coached by Mark Zimmerman. Marathon County 4-H teams are no stranger to national quiz bowl competition. 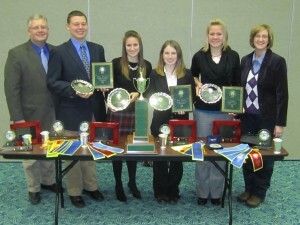 Marathon County 4-H has represented Wisconsin at this national contest in 2010 where they were Reserve National Champions. Much of their success is due to the youth’s willingness to practice and gain knowledge in these areas along with a great coach in Mark Zimmerman who has encouraged youth in contests for so many years. 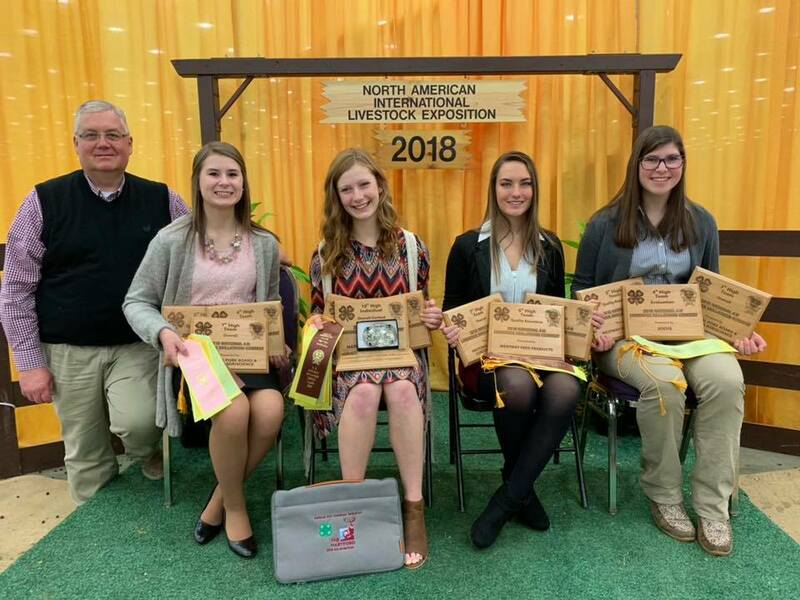 Wisconsin was the National Champion 4-H Skillathon Team at the North American International Livestock Exposition in Louisville, KY! After Reserve Champion finishes over the years, Wisconsin surpassed 19 teams to earn Championship honors. The skillathon team participated in individual and team stations of breed, equipment and meat identification, hay and wool evaluation, quality assurance, nutrition and marketing. 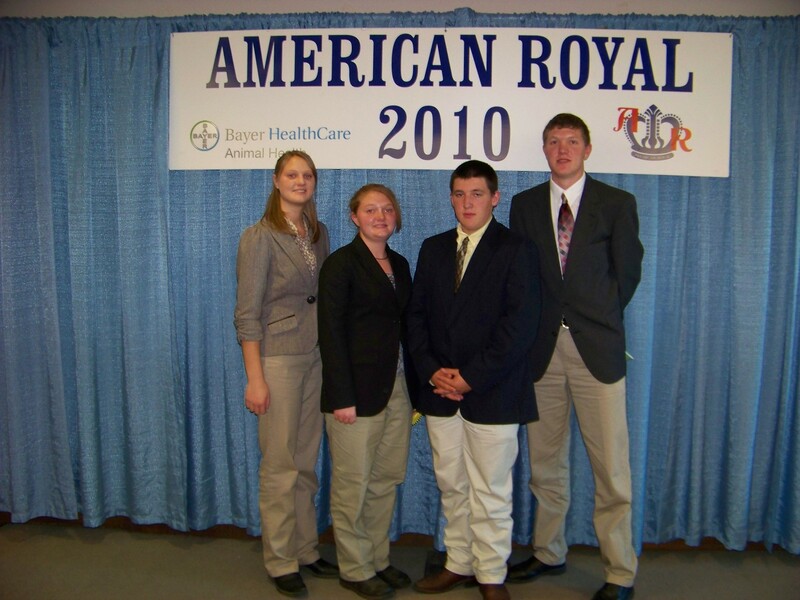 “This contest captures youth’s well rounded knowledge of animal science. This is a fabulous finish for Marathon County and the state of Wisconsin,” states Bernie O’Rourke, Extension Youth Livestock Specialist. Team members were: Morgan Zernicke, Theresa Bergs, Aaron Zimmerman and Maddy Schwede. They were coached by Mark Zimmerman and Jon and Joann Brubacher. The team was 1st overall, 2nd in Identification and 1st in Evaluation. Individually Morgan Zernicke was high individual overall and 1st in Evaluation. Theresa Bergs was 3rd high overall and 3rd in Identification. 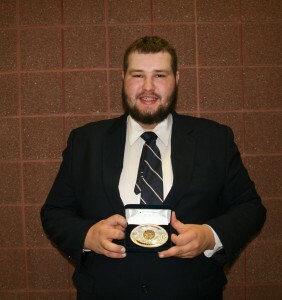 Aaron Zimmerman was 6th high overall and 4th in Identification. 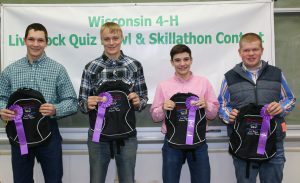 The team from Grant County that represented Wisconsin finished third overall in the 4-H Livestock Judging contest. This was one of the highest finishes in Wisconsin history. 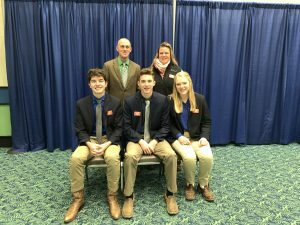 This contest was held during the North American International Livestock Exposition in Louisville, KY. Livestock teams judge classes in breeding and market of Beef, Sheep, Swine and Goats as well as answering questions and giving reasons to explain their thought process. 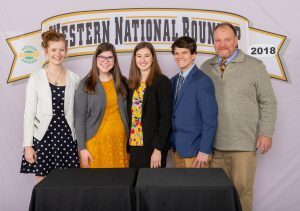 “This is a tremendous finish for a great group of youth and their coach who has trained many teams,” states Bernie O’Rourke, Extension Youth Livestock Specialist. Team members were: Kelli Retallick, Shea Esser, Amanda & Brian Patterson. They were coached by Dennis Patterson and Alicia Prill-Adams. The team was 3rd in sheep/goats and 6th in Beef. 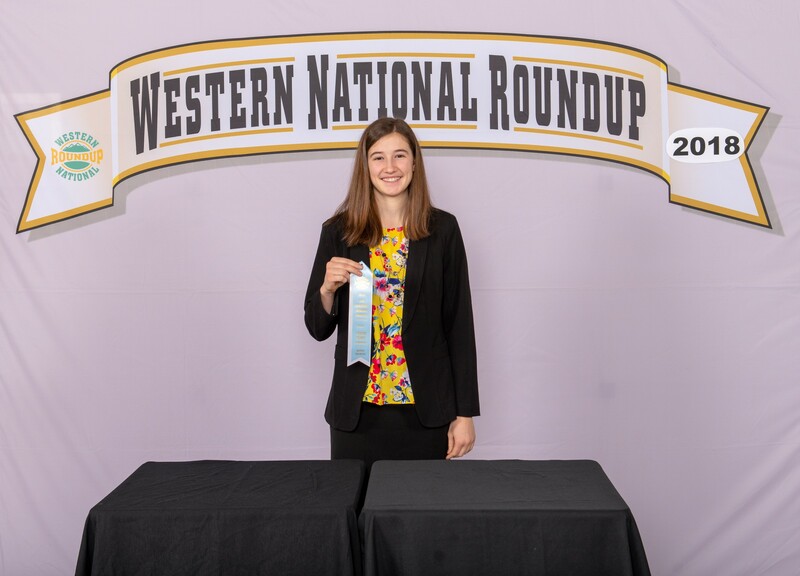 Kelli Retallick was 3rd overall, 1st in Beef and Beef Performance, and 7th in reasons. Amanda Patterson was 21st overall. With this finish, they were awarded the opportunity to travel to Europe to judge and attend the Royal Highland Show in Scotland, June 2011. 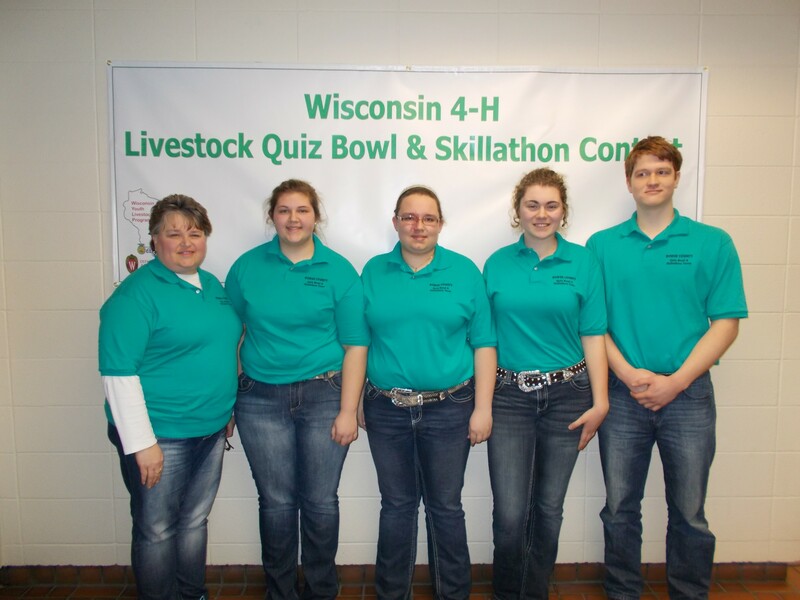 The 4-H Quiz Bowl team from Marathon County were Reserve National Champions. 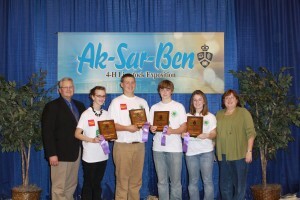 Quiz Bowl team representation was selected in January and traveled to AKSARBEN in Omaha, NE for its National contest. Students answered questions via a buzzer system on genetics, breeding reproduction, meats, etc. Team Members were: Abby Thunder, Aaron Zimmerman, David Bergs and Theresa Bergs. The team was coached by Jon and Joann Brubacher. 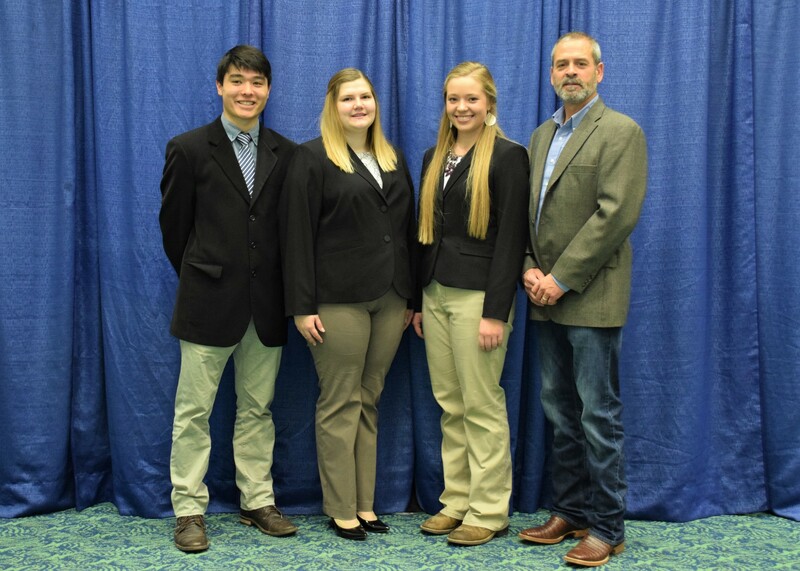 The Meats team was selected from the State 4-H meats contest held in February and competed at the American Royal in Kansas City, MO. Meats Judging ranks classes on beef, pork and lamb carcasses, retail, wholesale cuts, grading and retail cut identification. The Kansas City Meats team was from Grant County. The team was coached by Dennis Patterson. Team members were: Shea Esser, Amanda, Andrea and Brian Patterson. The team placed 6th overall, 4th in beef, 6th in pork, 7th in retail ID, 7th in total placings and 7th in reasons. Individually Andrea placed 5th in Beef and 11th overall. 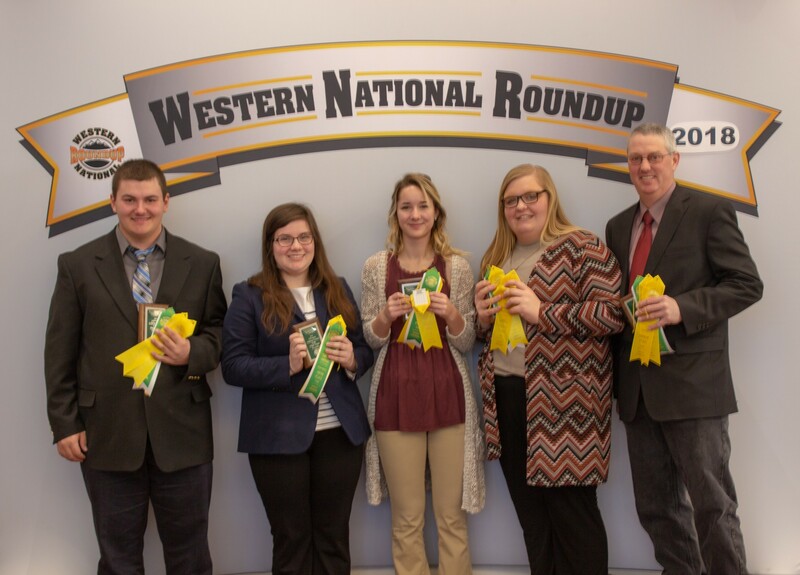 A Livestock team from Dodge County competed at the National Western Stock show in January. 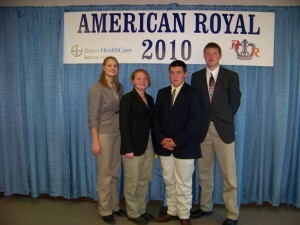 They were selected from the State 4-H Livestock contest that was held in July 2010. Livestock teams judge classes in breeding and market of Beef, Sheep, Swine and Meat Goats as well as answering questions and giving reasons to explain their thought process. Team members included: Christopher Vierck, Kelly Vierck, Alexus Butler and Collin Keel. The team was coached by Rebecca Doman, Amanda Doman and Rebecca Keel. The team placed 15th overall. Collin Keel was 1st in swine placings and 25th in swine reasons, thus 5th overall for total swine judging and reasons. Christopher Vierck was 21st overall in goats. 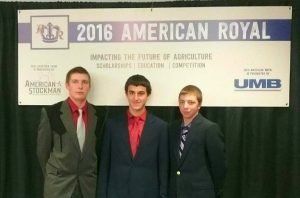 FFA teams from Grant county participated in both Livestock and Meats at the National FFA Convention in Indianapolis, IN in October. 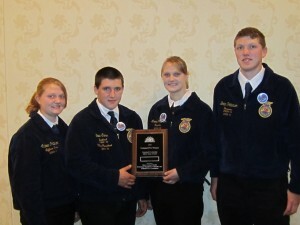 These teams earned the right to represent Wisconsin at the State CDE contests held in April. The Livestock team members were: Shea Esser, Amanda, Andrea and Brian Patterson. The team earned a Silver rating, a Gold individual rating went to Amanda Patterson and the remaining team members earned Silver.